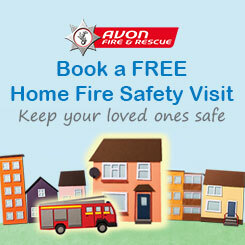 Avon Fire & Rescue Service (AF&RS) is teaming up with the Avon and Somerset Constabulary Nailsea Beat team for a Community Family Engagement Day this Saturday (22/09). Members of the public are welcome to join the services on The Green in Pill to see a selection of emergency services vehicles, ask questions around community safety and discuss up-coming recruitment campaigns from 11am-4pm. One crew from Pill fire station will be attending the event with a fire engine and will be on hand to answer questions around home fire safety and on-call firefighter recruitment. On-call firefighters work flexibly around other work and family commitments, while still being an important part of Avon Fire & Rescue Service by responding to emergency calls when needed. Marcus Sherborne, Watch Manager for Pill Fire Station, said: “Events like this are a fantastic opportunity for us to engage with members of the community who might not know the extent of what we do. “Pill fire station is an on-call station and is run by members of the public who provide lifesaving support alongside their normal jobs. “This is a fantastic role and we are always looking for new people to join the station. Anyone is welcome to come and discuss the role, ask any questions or see the equipment we have on offer. The Police will be bringing along a Mobile Police Station, transit prisoner van, a response police vehicle and a PCSO car. The beat team and police cadets will also be in attendance with their football cage and will be offering free bike marking on the day. Michael Jordan, Police Community Support Officer for Nailsea Neighbourhood Policing Team, added: “Engaging with the community is a really important role for us as a local police team and we aim to speak to residents at every opportunity.